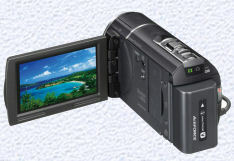 Today's consumer cameras, like the Sony HDR CX580V seen at the right, are highly sophisticated electronic machines, capable of operating in multiple modes. Many of their controls are only accessible through an internal menu, rather than through controls on the outside of the camera. Unfortunately, unless you read the technical manuals which came with your camera -- and few camera owners do -- and understand them thoroughly, many of the features which the salesman who sold your camera touted so highly are features that will hinder your ability to make videos that have a professional look to them. Here are a few of the most important features with which you should be familiar. Know which control on your camera turns off the date/time feature on your camera. It's probably a menu item. Once this information has been inbedded in your video it cannot be removed. The date and time will be on every foot of Cousin Billy's birthday video unless you turn it off before you begin shooting! Here's a tip within a tip: In the morning, before you start shooting, turn on the date/time feature and shoot the view out the window for 10 seconds. Then turn off the date/time feature for the rest of the day. When you look at your video months later, you know what day you were shooting, and where you were. Especially useful if you're on a travel vacation. VideOccasions' Judy keeps a diary when she travels, so that the video for each day can be coordinated with notes and commentary when she edits her tapes. A GREAT idea!! If you have any thought of editing the tape which you shoot, do not use the built-in fade and dissolve features in your camera if it has them. If you do a fade or dissolve in camera, there is no way to remove this special effect, and no way to recover the images that are lost as these effects are executed. If you bring tape in to edit, VideOccasions can show you how to accomplish fades and dissolves anywhere you want to create them. Use your camera's zoom feature sparingly. Most video cameras have a zoom lens, which enables you to go from a wide angle view to a close up at the push of a toggle. Zoom too much and your video will look like you're on a roller coaster, and will make it difficult to watch. If you intend to edit your video tape, using your zoom toggle is o.k. You'll need to use the zoom to change the apparent distance between you and your subject. Once you've zoomed in or out, shoot the scene for at least five to ten seconds before going on to your next shot. If you don't plan on editing your video tape, zooming may be necessary to make a transition between shots. If you must zoom, zoom slowly. Start with about five seconds -- a slow "one one thousand, two one thousand" -- during which there is no movement, then zoom in or out at a speed which is virtually imperceptible. At the completion of your zoom, remain stationary on the new scene for at least five seconds. Many cameras have a combination of optical and digital zoom. Our production cameras, for example, have an optical zoom of 12X -- that is, a magnification of 12 times normal. A menu selection allows the camera to zoom from 12X to 24X digitally, and another selection enables a zoom of from 24X to 48X. Most of the digital zoom range is of little use: the picture begins to break up after about 20X, and images look grainy and digitized. So do some experimentation before you take your camera out to shoot your once-in-a-lifetime trip to Antarctica. Familiarize yourself with all the features on your camera before you take it out to shoot. Read about all the automatic features on your camera, especially white balance and focus. Do these also have the potential to be done manually? If so, familiarize yourself with how these features work. Viewfinder fuzzy and hard to see through? Look for the diopter control on your viewfinder, a focusing mechanism that allows you to adjust the viewfinder for your eyesight. It's probably a little lever on the top or bottom of the viewfinder. While you're at it, look at all the icons and writing in the viewfinder. Each is a piece of information vital to the operation of your camera, telling you, for example, that there is no tape or memory card in the camera, no battery, how much recording time is left and whether there is adequate light for shooting. The owner's manual which came with your camera probably has a page or two explaining each icon and viewfinder comment. Xerox this page and keep it with you when you go out with your camera. It will be invaluable when "ND2" or a blinking lightbulb appears in your viewfinder and you can't remember what that means for you. You can make the most of all the features of your camera by learning when to rely on the camera and when to take control yourself. Your owner's manual provides all the necessary information. Read it, and get the most from your investment.